When so many businesses are focusing on implementing incentives and programs to improve employee wellbeing and lower health care costs, Amazon is in a unique position to nip such issues in the bud from the get-go. Last month, Amazon received more than 200 proposals from cities across the country vying to become home to the company’s covetous second headquarters, an honor that will bring a $5 billion facility and 50,000 jobs. Though Amazon’s conservative benefit offerings have set it apart from others in the tech industry offering trendy benefits such as free food of laundry services, its Seattle campus is a legendary example of corporate culture, boasting rooftop gardens, biospheres, and flexible, pet-friendly office spaces. What city wouldn’t want to welcome Amazon’s second headquarters? Cities’ bids included everything from the sensible–outlines of transportation and infrastructure and myriad tax incentives—to the absurd—Stonecrest, Georgia, offered to rename itself Amazon, and Birmingham, Alabama placed giant Amazon boxes throughout the city to promote its bid. 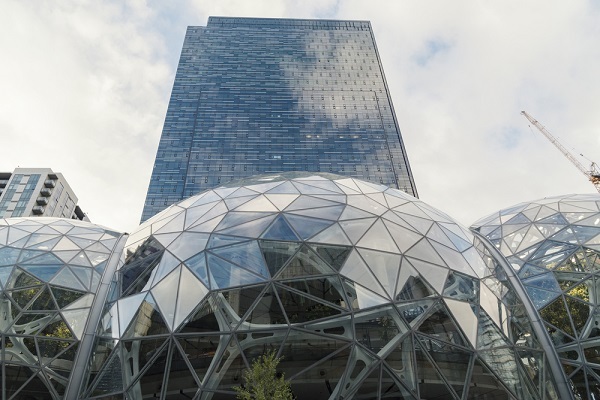 In an editorial published on Huffington Post, however, public health policy expert Brian Castrucci makes an appeal directly to Amazon founder Jeff Bezos to put one factor ahead of the rest as the company evaluates the bids: Health policy. When so many businesses are focusing on implementing incentives and programs to improve employee wellbeing and lower health care costs for themselves and their employees, Amazon is in a unique position to nip such issues in the bud from the get-go. Complete streets: This policy point encourages cities to consider the various modes of transportation available to residents, including cars, public transit, bike and foot traffic. “Complete streets policies also keep people active, which, ultimately, will mean lower health care costs for you,” says Castrucci. High-quality, universal pre-kindergarten: This particular policy takes aim at long-term community improvement, connecting investment in education to better, higher-paying jobs later in life. Other policies addressed include inclusionary zoning regulations, the sale of alcohol, efforts to curb tobacco use, access to healthy food and air quality standards. “Ultimately, we know that a healthy workforce is more productive workforce and has fewer absences,” writes Castrucci. “It is undeniable that employee health is indelibly tied to the health of the community. “Mr. Bezos, you changed how we buy and sell products,” Castrucci writes in his final plea, “By including the presence of specific policies that are business-friendly and that support health in your decision-making process, you have an opportunity to set a new standard for how businesses interact with and influence the communities where they are located; how businesses can impact and improve the health of the nation.